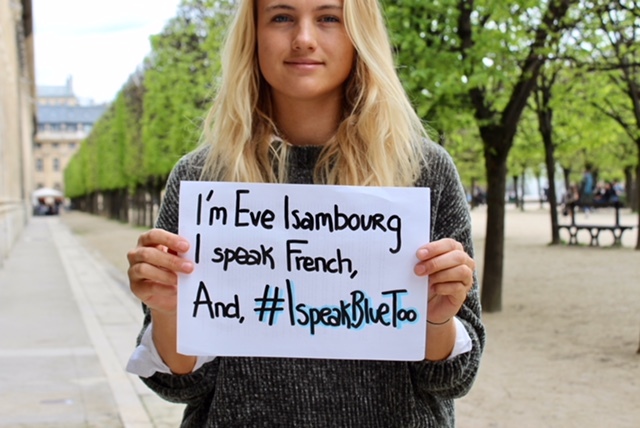 This is Eve Isambourg – a good soul, a voice for the ocean, a surfer, and the #iSpeakBlueToo founder! She is officially launching the #ispeakbluetoo campaign @ispeakbluetoo, supported by the @ioc_unesco and @unesco, dozens of NGOs and other organizations, and BY ALL OF YOU LOVELY PEOPLE! In our following interview, we want to present you the campaign, the idea behind it and introduce you to this lovely soul, Eve Isambourg. 1. What does the Ocean mean to you? The Ocean reminds me where I am born – on the Northen Coast of France – and it reminds me of where I grew up, in Mauritius Island, which I call Home now. The Ocean reminds me of the beauty of life, how peaceful it can sometimes be, and how courageous you have to be to overcome the obstacles. It also reminds me that sometimes it is better to let go, as it is useless to paddle against the tide. The Ocean means Nature, and it is where I feel One with myself and the environment. The Ocean is the best natural playground for our riding activities, happy surf sessions with friends, beautiful underwater biodiversity to observe, unforgettable sunsets to live (…)And today, protecting the Ocean is my fight, “Healthy Ocean” is my motivation. 2. How do you get inspired? I am inspired when I am happy, sad, excited, nostalgic (…) In other words, I am inspired when I feel. Feelings make me feel alive. I am inspired when I smile, and so, I’ve decided to smile all the time. I think that when you smile at life, it offers a world of inspiration: smile to new people you’ll meet, new experiences you’ll live, new places you’ll travel to. Being inspired is being open to anything, any opportunities, any adventure. You have to observe, be curious, and smile. This is what I do. On top of this, find those places and people that inspire you for what they are, what they do. I love to be next to the Ocean, it inspires me so much, from the sound of the waves kissing the shore, to the shape of the barrel, or the colors of the lagoons or deep seas. 3. What was the trigger for being more aware of plastic and the ocean? How did you change your mind? I grew up in Paradise, Mauritius. It is really heaven on Earth, the lagoons in the South West of the Island are pure jewels. I live in a bay there, and there is a river flowing into the Ocean, and thus, waste. During the hurricanes, I was realizing that the waste from the inland finds a way to the Ocean, and surfing among plastic bottles and metallic cans was not AT ALL a happy feeling. I was around 13 years old, and I knew something was wrong. Then, we travelled to Indonesia several times with my family, and to other surf spots in the world… Australia, Morocco, France (…) I was more and more aware of the urgency of the situation but was not acting or doing anything. Finally, 2 years ago, I entered Sciences Po University in Paris, and very quickly I was missing the Ocean, I was missing being surrounded by nature. So I’ve decided to combine my passion, with my studies, and decided to dedicate my professional carrier to environmental issues, acting for change, and raising awareness to protect our planet.I am willing to be committed, and to work along with NGOs, companies and organizations worldwide in order to inform people about Ocean Conservation, oceans being threatened, and encouraging concrete actions. Being a practical and essential tool for action, I am very interested into “Environmental communication” field of study. #IspeakBlueToo is a social media campaign for the Ocean, and more precisely in support of the World Oceans Day that we celebrated at 8th of June. Supported by The Intergovernmental Oceanographic Commission of UNESCO, dozens of NGOs worldwide and thousands of people, it is a human wave of individuals raising their voices to protect the Ocean. 5. Can you give us 5 easy tips how to change our habits? How do you avoid plastic? Which alternatives to plastic have you got? 1. Forget about plastic bags, plastic straws, plastic cutlery: use recycled and reusable stuff! 2. Don’t throw your cigarette butts on the ground or the beach. It always finds a way to the Ocean, and contains very toxic ingredients. 3. When you go to the beach, bring a reusable bag with you, so that you’ll be able to do your own clean-up, and join local clean-ups when you can. 4. Choose your cleaning products carefully. Many household chores can be done with simple, non-toxic ingredients like vinegar, baking soda, or lemon juice. It’s the same for washing your car, don’t do it at home. By doing so, you’re washing oil, grease, and fluids like antifreeze and transmission fluid into the sewer, where it flows untreated to the waterways. 5. Be careful when choosing your solar cream, some toxic products (especially oxybenzone and octinoxate) contribute to coral bleaching. 6. What is your message to the ocean? People care. This is what I want to tell the Ocean. Even though, at the moment we are killing you, there are a lot of people that don’t accept what is happening. Those people are raising their voices, thanks to the work of hundreds of NGOs worldwide, and movements like #IspeakBlueToo. “From awareness to concrete actions”, that is the challenge of today! We’ll do our best. And I will fight for what I think is right. If you die, we die as well. So it is time to react. Thousand thank you for this lovely article – I love your blog! Keep sharing the good vibes! IT IS AWESOME! „IT DOESN‘T MATTER WHERE WE LIVE OR WHERE WE GO, WE WILL ALWAYS CARRY THE SALT OF THE SEA IN OUR HAIR“.